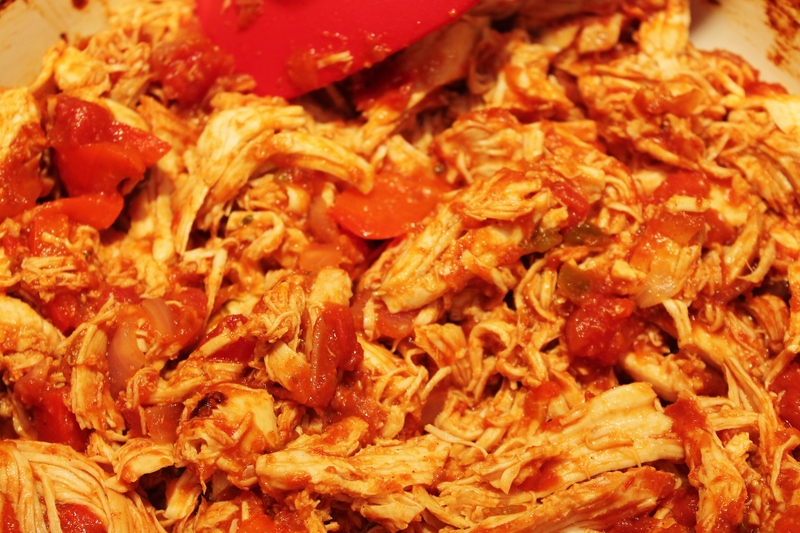 Salsa Chicken is a popular dish among meal preppers. It’s cheap, easy to prepare, and absolutely delicious. Best of all, it keeps well for an entire week. Pair it with Black Bean & Veggie Quinoa + your favorite veggie and you’ve got yourself a weeks worth of balanced meals! Whether you’re a prepping pro or a complete amateur, these fool proof recipes will leave you with delicious meals all week long! This step by step guide will help you get your meal prepping done as quickly and effortlessly as possible. Step 1: Preheat your oven to 375 degrees F.
Step 2: Wash and dice 1 Red Bell Pepper & 1 Red Onion. 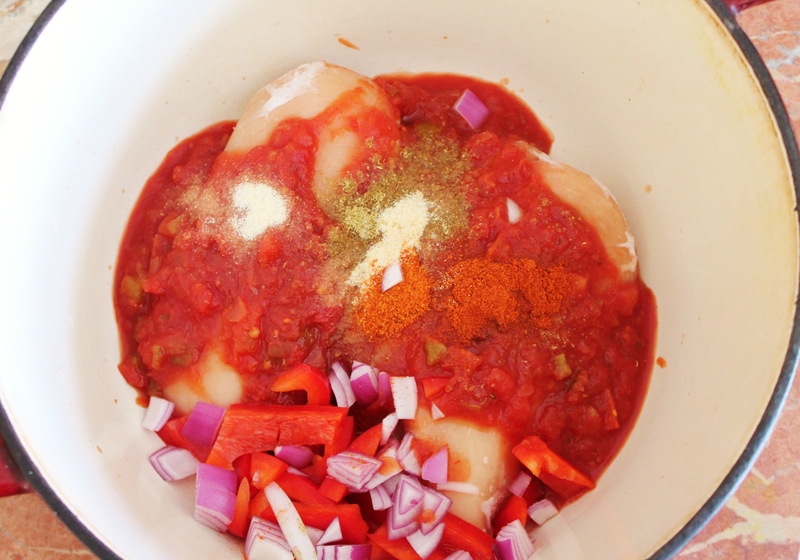 Step 3: In a dutch oven or baking dish, add all Salsa Chicken ingredients and cover. Place in oven for 1 hour if frozen or about 45 minutes if fresh. Keep track of time by setting a timer or writing down the time that your chicken went into the oven. Step 4: If your Quinoa is not pre-rinsed, rinse it now and set it aside. Add 1 tsp of oil to a small-medium sauce pan over medium heat. Add the rest of the red onion that you diced earlier and saute until it’s translucent. Add rinsed quinoa and let the quinoa toast in the pan for 2-3 minutes or until you hear popping sounds. If you rinsed your quinoa, it should be dry at this point. Add 2 cups of hot water and let it come to a boil. Once boiling, reduce heat to low, cover, and let cook for exactly 15 minutes. Set another timer or write down the time you covered the quinoa to keep track. Step 5: Cut 1/2 a jalapeno if you want a spicy kick added to your quinoa. If not, proceed to adding all your quinoa ingredients to a bowl. You can add everything but the quinoa… that should be cooking! 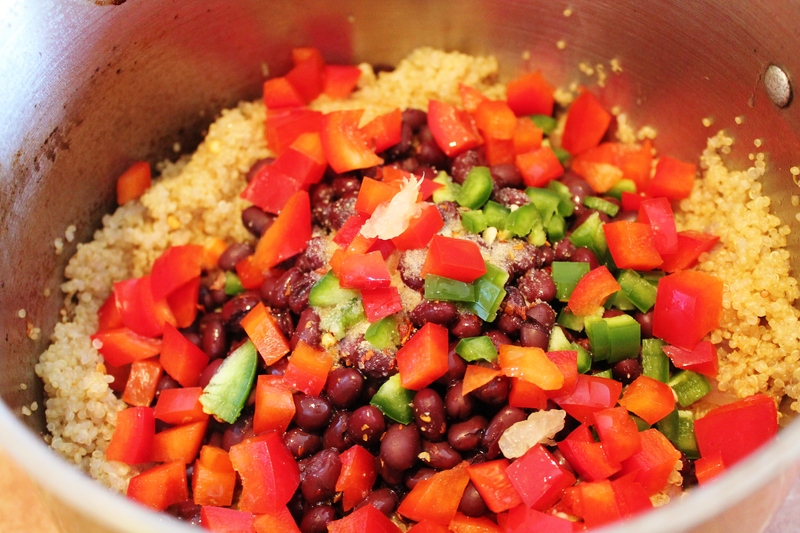 Step 6: Once the quinoa is done, add it directly to the bowl with the rest of the ingredients. You don’t need to let it cool. Voila! Your quinoa is done! Step 7: Once your chicken is done, you have a few options. You can either leave it whole, cut the breast pieces in half, or shred the chicken. I prefer to shred it so that the sauce coats all of it. Step 8: Portion your quinoa and chicken into 5 containers and refrigerate. Step 9: Give yourself a huge pat on the back… your prepping is done! Note: It’s best to balance your meals by adding 1 carb + 1 protein + 1 veggie to every meal container. I paired this meal with a small spinach salad to get some greens in! Add your favorite veggie for a complete and balanced meal. Preheat your oven to 375 degrees Fahrenheit. Combine all ingredients in a dutch oven or baking dish. Cover and bake for approximately 1 hour if chicken if frozen, 45 minutes if fresh. Shred chicken if desired. Rinse Quinoa unless it has been pre-rinsed and set aside. Saute red onion in 1 tsp of olive oil over medium-low heat until translucent. Add quinoa and cook for 2-3 minutes until you hear popping sounds. Quinoa should be slightly toasted. Add 2 cups of hot water/broth and bring ti a boil. Once boiling, cover, reduce heat to low and allow to cook for 15 minutes. Combine all other ingredients in a bowl. When quinoa is cooked, add quinoa and mix. Did Someone Say Carbs? 5 Quick & Easy Carbs for Your Meal Prep Sunday. I’m in a constant battle with carbs. My heart says yes but my love handles keep telling me no… We’ve parted several times in the past but distance just makes the heart grow fonder. After years of battling with each other, I think we’re finally starting to develop a healthy relationship. Over time I’ve learnt that carbs can be your best friend or your worst enemy. There’s good carbs, bad carbs, and horrifying carbs out there, and choosing the right ones will keep your relationship going strong! I realize I’m starting to sound like the Dr. Phil of carbs so let’s move on! I’ve had a lot of people ask how I keep up with meal prepping. At least 50 people have asked me how I eat the same thing every week without getting bored. The answer to that is that I don’t! Some people have no problem eating the same meal week after week and if it works for you, that’s completely fine… but if you’re like me and need some variation in your food, switching up your carbs is one of the easiest ways to keep things fresh, new, and delicious. As I mentioned in my meal prepping guide, carbs should be part of your weekly meal prep. Each meal should consist of 1 protein + 1 veggie/green + 1 carb. My hope is that after reading this post, you’ll have plenty of ideas for that 1 carb! When it comes to carbs, try to steer away from simple starches and towards more complex carbs. Everyone’s nutritional goals are different but regardless of whether you’re looking to bulk, maintain a weight, or shred some pounds, complex carbs are a great option for everyone. Rice is a meal prep staple for many people. From Jasmine to Arborio, there’s dozens of varieties out there. Rice can be quite starchy but brown and wild rice are two great options. Rice stays good in the fridge for about a week. If you find that your rice gets hard, simply sprinkle some water on it when reheating and it’ll soften right up. Pasta can be a great carb option. The important thing with pasta is to look at serving sizes and portion your meals accordingly. If you have a food scale, weigh it out so that you know how much you’re consuming. 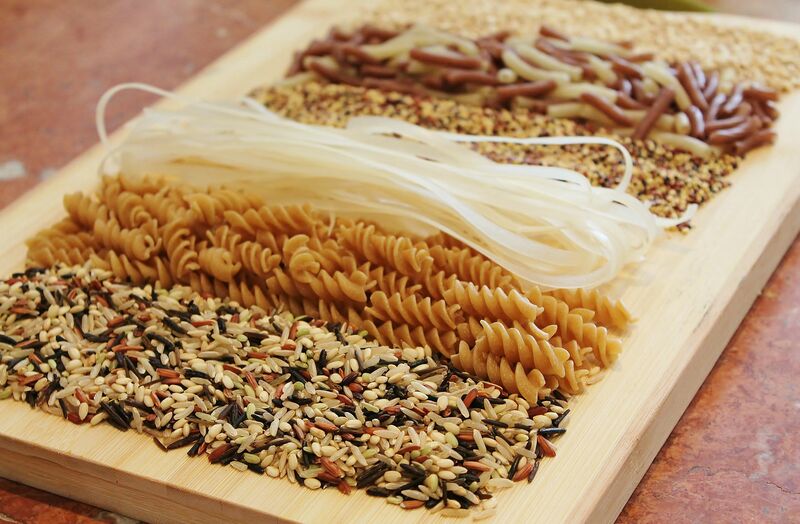 Traditional pasta can get a little starchy but luckily, there’s dozens of healthier options readily available. 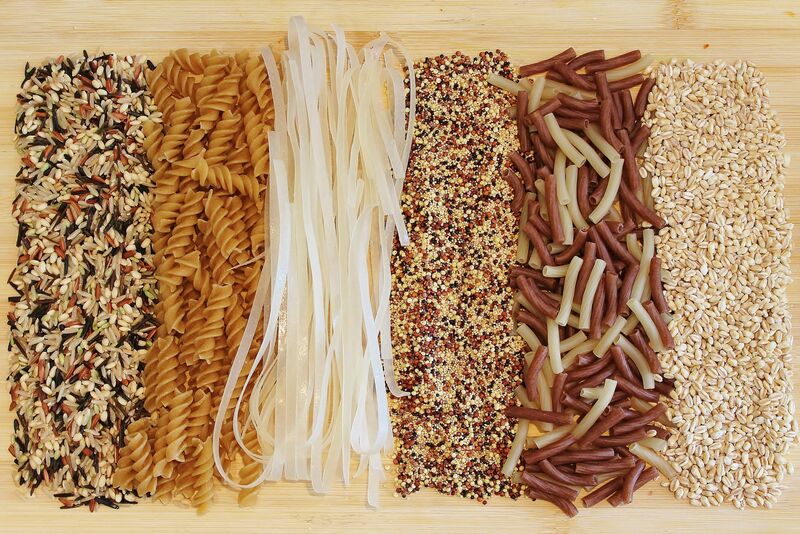 My favorites are whole grain pasta, quinoa pasta, and brown rice pasta. For individuals avoiding gluten, rice noodles prove to be a great substitute. Most varieties of pasta take under 10 minutes to boil and stay fresh for a week. Quinoa is my personal fav! Have I said that already? Despite being a great carb option, quinoa is a complete protein and takes exactly 15 minutes to cook. It’s also a great option for those looking to avoid gluten. Cook up a batch on Sunday and it’ll last you the entire week. Quinoa comes in red, black, and white varieties. You can also find many different quinoa blends. My favorites are quinoa-rice blends and quinoa-amaranth-millet blends! Barley can be eaten just like rice, quinoa, or pasta. It’s a versatile grain with a mild nutty flavor that takes on the taste of whatever you pair it with. Did I mention it’s loaded with fiber!? 100 grams of barley will provide you with a whopping 17 grams of dietary fiber! Lentils… While it’s true that lentils are an excellent source of protein, they’re an equally excellent source of carbs. There are dozens of varieties out there and they can be prepared in hundreds of ways. 100 grams of red lentils will provide you with 20 grams of carbs (8 grams of fiber), 9 grams of protein, and only 0.4 grams of fat. Lentils are commonly used in soups and stews but can also be boiled dry. Salads topped with boiled green lentils are delicious (I’ll post a recipe soon!). Some other great options include sweet potatoes, whole grain breads, tortillas, and beans. I’d love to hear your favorite carb options. Comment below and tell us your favorites! P.S. This week, I’ll be providing all the tools to make your Meal Prep Sunday a breeze! 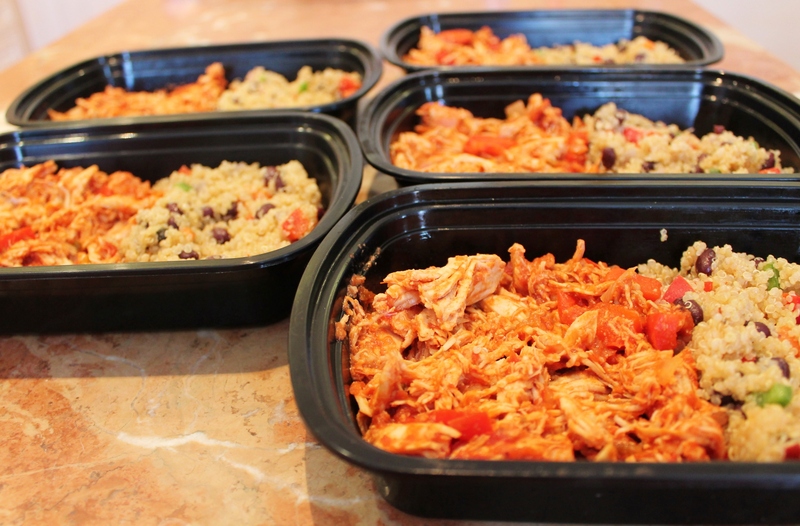 Look out for grocery lists, meal plans, and recipes for this weeks Meal Prep Sunday!